Since the end of the Second World War, rumors regarding the existence of giant pyramids in China have been appearing with increasing regularity in the press and literature of many countries. There has been talk of structures whose size puts to shame the Cheops Pyramid of Egypt and the Sun Pyramid at Teotihuacan in Mexico. I’ve journeyed deep into China three times to discover the truth behind these rumors. All three times, these pilgrimages have taken me into Shaanxi Province, to an area about 40 miles south-west of the ancient Chinese capital of Xian, in the mountainous Qin Ling Shan region. I was searching for a pyramid which was said to have been, once, many millennia ago, multicolored, and to now be a dusty white. This was a pyramid which, legend has it, rises to the astonishing height of 1,000 feet - four-fifths the elevation of the Empire State Building. Not only was this extraordinary structure said to be the largest pyramid in the world (the Giant Pyramid of Egypt, by comparison, rises a mere 450 feet); but, in the valleys surrounding it, there were said to be dozens of other pyramids, some rising to an elevation almost as great. Until recently, Chinese officials have rebuffed all questions about these pyramids and all requests to view them. And yet, over this century, a certain mythology has grown up around them. An American trader, stumbling upon these amazing structures in 1912, asked his Buddhist monk-guide about them. He was told that 5,000-year-old monastic documents not only contained information about these pyramids, but said the pyramids were extremely old when these records were made. The trader, Fred Meyer Schroder, observed several smaller pyramids in the distance. He wrote in his travel diary that his first sight of the giant pyramid, along with its smaller cousins, rendered him almost speechless. "It was even more uncanny than if we had found it in the wilderness," he wrote. "But those [ pyramids) were to some extent exposed to the eyes of the world - but still totally unknown in the western world." In the Far East in the spring of 1945, though Japanese troops were still fighting in China, the U.S. Army and its allies were well on their way to pushing the Japanese off the mainland. One day, U.S. Air Force Pilot James Gaussman was returning to Assam, in India, after having flown the ‘Burma Hump’ - ferried supplies to Chungking, China, from India - when engine trouble forced him to descend temporarily to a low altitude over China. "I flew around a mountain and then we came to a valley. Directly below us was a gigantic white pyramid. It looked as if it were from a fairy tale. The pyramid was draped in shimmering white. It could have been metal, or some other form of stone. It was white on all sides. What was most curious about it was its capstone: a large piece of precious gem-like material. I was deeply moved by the colossal size of the thing." When Gaussman arrived back in Assam, combat duties pushed the sighting from his mind. 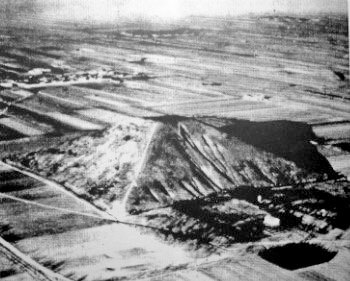 Two years later, in 1947, another U.S. aviator, Maurice Sheahan - this time flying over Shaanxi Province, not far from Xian - caught sight of a giant pyramid in the misty landscape below and rapidly snapped pictures. This time, several U.S. newspapers, including the New York Times for March 28, 1947, published ac-counts of the airman’s sighting. But Chinese archaeologists continued to deny the existence of such a structure, even though Sheahan’s photographs suggested it was higher than any pyramid in Egypt. Captain Bruce Cathie, of Auckland, New Zealand, is an airline pilot turned explorer and UFO investigator. In 1962, reading Schroder’s diaries, he decided to get to the truth about these pyramids in China. Cathie contacted the Chinese embassy in Wellington. To his surprise, he was told there were no such things as pyramids in China. Later, the authorities acknowledged the existence of such structures, but would not characterize them as pyramids. Rather, they told Cathie, these were trapezoidal burial tombs dating from the Han Dynasty. In his book, The Bridge to Infinity, Cathie sets forth his theory that the Great Pyramid of China - which he was never able to locate - is part of an ancient network of pyramids built at key places around the world to tap the earth’s natural energies. He suggests that these structures mark the intersecting points of ley lines, or dragon ways. Does Cathie believe these ‘orthotenic’ lines, to use Aime Michel’s phrase, represent the flight paths of UFOs, with greatest activity at intersecting points like those of the pyramids? Yes, he does; and he seems to imagine the earth as encircled by UFO flights in the ancient past. Whether what Cathie calls "world grid harmonics" includes in its network the legendary White Pyramid of China or not, it seemed clear to me that the symbol of a white pyramid of China resonated powerfully on a psychic level, that it was at the very least a powerful conduit of psychic energy - whether it had any physical reality or not. But there was no shortage of those who claimed it did. Well-known American traveler and author David Hatcher Childress reports in his writings that archaeological excavations of the White Pyramid have brought to light magnificent jade objects and "green stones." But he offers no corroboration for this provocative statement. Still, along with the stories I have just recounted, I had heard so many vague rumors about the pyramid’s actual existence, that I resolved once and for all to get to the heart of the matter. And so it was that, in the summer of 1994, I found myself along with my friend and colleague, Austrian journalist Peter Krassa - in a green agricultural area about 50 miles from Xian. It had not been easy for us to get here. We were in one of Chinas "forbidden zones" - it was, we thought, highly probable that we were near a top-secret military base - and we were certainly the only tourists here, and almost the only people. We had managed to get to Xian almost entirely by chance. In Vienna, early in 1994, I had been lucky enough one evening to meet Mr. Chen Jianli, who had come to the Austrian capital to give a lecture promoting tourism in China. I had broached to him the subject of my research into the more mysterious artifacts of China, including its rumored pyramids. My enthusiasm made Mr. Chen smile. It so happened that he had been born in Xian; that was why, despite the official party line, he did not consider the subject of pyramids in China to be nonsense. As a matter of fact, he had, even as a small boy, heard people talking about them. It was his understanding that there was a group of pyramids not far from Xian, all of them at least 2,000 years old, but not all of them necessarily regarded strictly as pyramids. But he didn’t know for certain; and people did not-or could not-go to where these structures were supposed to be. 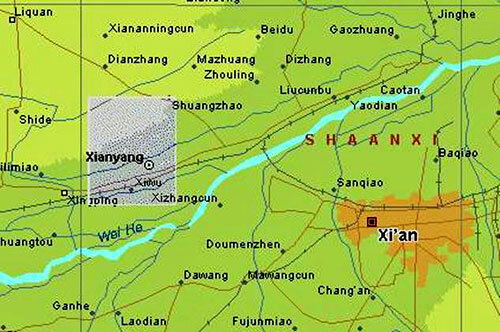 And so it was that, after an evening of lively discussion, Mr. Chen Jianli offered to contact his acquaintances and officials at the appropriate ministry in Beijing, and make it possible for me and a small group of interested individuals to obtain permission to travel to this up-till-then forbidden zone in Shaanxi Province. And, through his connections in the Chinese capital, he was indeed able to obtain a special permit for me to travel to the forbidden zone near Xian-not once, but three times; in March and October of 1994, and again in the summer of 1997. Arriving for my first visit, I first spent a brief time in Beijing, where I discovered that the Chinese really do not like to talk about their pyramids. When I brought up the subject with certain high-ranking archaeologists at the Academy of Sciences, I couldn’t help noticing a certain anxiety. Only when I showed them the Gaussman photo did they reluctantly confirm the existence of "just a few pyramidal structures near Xian." A few days later, Peter Krassa and I were standing in a green, partially cultivated plain just a mile from the township of Xianyang, and about 40 miles west of Xian, that former imperial capital that is now regarded as the cradle of Chinese civilization. There was no 1,000-foot-high White Pyramid to be seen. But there were indeed pyramids in this silent plain which did not need my imagination to invest it with a certain magical beauty. Before me stood a beautifully symmetrical pyramid about 200 feet high. 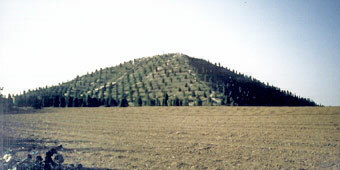 Numerous small trees were planted up and down its sides; I had been told that, over the past four or five years, the Chinese had been planting fast-growing conifers-a kind of Cypress tree - on the slopes of these pyramids. I scrambled quickly to the top of this pyramid, the first that we had encountered. The construction of these smaller Chinese pyramids is similar to that of the pyramids of Teotihuacan, near Mexico City: piled earth - almost clay, with stepped sides, hardly the spectacular engineering of Pharaoh Khufu. The tops of most of these Chinese structures are flattened off, as is the case with the often-rectangular structures of the Mayans. These Chinese pyramids are undecorated, and significantly damaged by erosion and farming. Their earthen sides-or such was the case with the small pyramid on which I stood-have become almost as hard as stone over the centuries. I noticed that I was standing in a sort of crater, indicating to me that there had once been a cavern in this structure before the elements had caused its roof to collapse. "None. We have been given no money nor instructions. It will have to be for the next generation." At least as exciting for me as this pyramid was the view from its summit. In the distance, I could make out at least 15 other similar pyramids, spread out before me in a panoramic sweep. Some stood in solitary fashion, while others were grouped in twos or even in rows. There were pyramids as far as the eye could see. I wondered what strange events had unfolded in relation to these pyramids in ancient times. Now there was nothing but the green fields, the pyramids, and a silence broken only by the slow movements of the handful of farmers working the ground with ploughs so primitive they must have looked just the same when these pyramids were built. During this visit, and during my second later that year-and on my third in the summer of 1997-I found no evidence for the physical existence of the fabulous White Pyramid of China. But, strolling from one of these time-worn structures to another, I began to feel almost at home in this strange, eerily beautiful, city of the dead? I didn’t know; but, as I continued to meet officials and to cautiously feel them out, I began to discover that there were indeed theories about these 16 pyramids near Xian, and that some of these theories were of a decidedly mystical nature. There were seemingly staid government scientists whose views were not entirely dissimilar to those of Bruce Cathie of New Zealand. 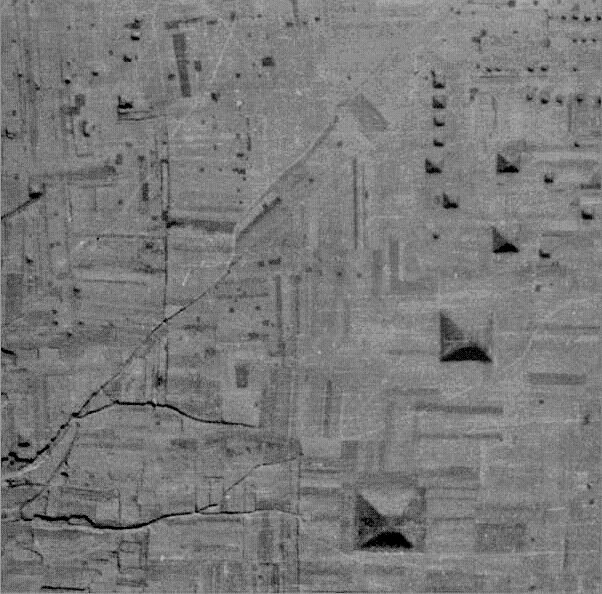 Dr. Wang said he estimated the age of these pyramids at 4,500 years and that he believed they might have been arranged to mirror the shapes of certain constellations in the night sky, just as certain key pyramids in Egypt are now thought to have been constructed in imitation of the constellation Orion and related stars. The Chinese pyramids near Xian bear witness, suggested Professor Wang Shiping, to the immense knowledge of geometry and mathematics enjoyed by the Chinese of almost five millennia ago. Peter Krassa and I discovered that these are certainly not the only pyramids in China. 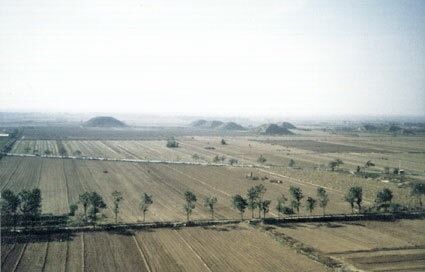 In January,1994, archaeologists discovered several pyramids near the Wei Ho River, north of Xian. One of them, we were told, is located almost exactly in the geometric center of the ancient Chinese empire. I believe there may be as many as 90 to 100 pyramids in China in all, with the White Pyramid of Xian towering above all the rest - if that enigmatic giant does indeed exist. I discovered that, if scientists and investigators could tell me nothing about the White Pyramid, they all at least had heard that it existed. And I decided that where there is smoke there must be fire, even if the smoke is only the nexus of a resonating cluster of powerful, important, almost-psychic beliefs. And so it was that, in seeking to discover the true identity of the White Pyramid, I once more immersed myself in the history of ancient China. It is thanks to the Shih Chi (Records of the Grand Historian of China), by the very great Chinese historian Sima Qian (145-86 B.C. ), that we can be fairly certain that the emperor’s grave is located beneath a particular hill 150 feet high and planted with grass and trees. Apparently, the hill is man-made; according to Sima, a 140-foot-high pyramid complete with five terraces lies beneath it. In his Shih Chi, Sima Qian - who really was the Grand Historian of China, though at the court of Emperor Wu - states that almost 700,000 workers labored for 20 years to create the tomb of the Emperor Qin Shi Huangdi. He says the earth was removed down to the ground water level. Then the floor was poured with molten bronze. A stone sarcophagus was laid on this platform. When the structure was completed, those who knew where the entrance was were silenced by being entombed alive. To further disguise the entrance, the pyramid was covered with earth and grass to give the impression of a natural hill - a strategy which is strangely present in the smaller Xian pyramids of today! The pyramid’s interior, we are told, is astonishingly elaborate. Sima uses the term "artificial universe" to describe the ceiling of the emperor’s tomb-chamber encrusted with thousands of glittering precious jewels to recreate the constellations of the heavens. "In the tomb-chamber the hundred water-courses, the Chiang [the Yangtze River] and the Ho [the Yellow River], together with the great sea, were all imitated by means of flowing mercury, and there were machines which made it flow and circulate. Above [on the roof] the celestial bodies were all represented; below [presumably on the floor or on some kind of table] the geography of the earth was represented." That is, the emperor’s tomb-chamber was meant to be a living replica of his empire, including both the earth and the heavens. Recent excavations around the outer perimeter of this burial hill seem to confirm Sima Qian’s statements: Analysis of the surrounding earth revealed an exceptionally high concentration of mercury. Apparently, archaeologists are taking seriously the Great Historian’s description of what amounts to a ‘high-security’ tomb. "We are leaving the tomb-chamber under the hill to the future, so the next generation has something to work on." How does the extraordinary story of the tomb-chamber of Shi Huangdi relate to the seemingly mythical White Pyramid of Xian? Yes, the mercury was used to provide a flowing liquid to make it possible for a vast relief map of circulating great rivers and streams of China to run forever in the tomb-chamber of the Emperor’s mausoleum. But, for the ancient Chinese, "forever" is a charged word when it comes to mercury We will recall that we have en-countered mercury before, in the guise of cinnabar, or mercury sulphide - perhaps the most potent of all the substances used in the vast, ongoing ancient Chinese industry of trying to discover the elixir of deathlessness. The tomb of this emperor, surrounded as it is by a garrison of some 1,400 terra cotta statues including archers, cavalry troops, charioteers, infantrymen and horses, represents nothing less than a colossal effort to attain to the state of Hsien, or material immortality. This tomb is truly the ultimate Project Apollo of the Chinese emperors. The cost of the mercury alone must have been enormous-the equivalent of filling the tomb with uranium, or plutonium. And what now lies in the tomb? Have we here encountered a clue as to why so little is known about the efforts of the Chinese government to excavate it? A year or so ago, a report leaked out of Beijing that the tomb-chamber of Qin Shi Huangdi was "like a palace." The implication was that a camera had been lowered into its unknown depths. Yet officials have clearly stated that "nothing has yet been done" in terms of its excavation. Authorities have made similar claims regarding the 90 or 100 other tombs, or burial mounds, that rise up not far from Xian and the mausoleum of the emperor. If an entire terra cotta army stands outside his tomb, then what analogous splendors lie inside? Treasure, yes; treasure worth billions of dollars. Why then has the Chinese government not entered the tomb and retrieved these treasures, if for no other reason than to make use of the astronomical wealth they represent? Because, I believe, there is more at stake within the tomb of Shi Huangdi than simply riches; there are unheard-of secrets of material immortality, which only this emperor had the power and the wealth to seize upon. I believe there are people within the Chinese establishment today who know of these secrets, and who see to it that the tomb of Shi Huangdi is never touched. Yet rumors have filtered out; clandestine legends have built up over the past 2,000 years; these myths of wonders in the tomb of the First Emperor have taken on a veiled form-that of the White Pyramid of Xian. This may be because the White Pyramid itself is more than legend. I believe there is a Secret Society of the White Pyramid of China. I believe it is highly possible that the rulers of the vast and brilliant Middle Kingdom never ceased to believe in the reality and power of the state of Hsien and that their efforts to attain it would ultimately be successful. I believe there may be a secret society today - one incredibly ancient - whose members think, in fact know, that the tomb of the emperor, while filled with treasure beyond imagining, contains only the illusion of a body; who know that the emperor himself, wearing the vestigial body of the Hsien, has long since gone into the realms of material immortality, transmuted into that state by the catalytic agency of his bath of mercury. I wonder what other members of the Secret Society of the White Pyramid ‘reside’ in the 100 or so other burial pyramids rising up modestly, though not inaccessibly, distant from the tomb of the emperor? Are these tombs also empty? If they were to be opened, and a ragged corpse discovered there, would not that be merely an illusion meant to mock grave robbers while, thanks to the genius of the ancient art of alchemy - and perhaps a greater Genius, and one far more ancient - the former resident of this tomb has for centuries roamed the heavens and the earth? There may be, living among us today, members of the Secret Society of the White Pyramid - keepers of its secrets, aspirants themselves to the state of Hsien - who know that material immortality is a reality, and who hide this knowledge from the general public. These members who number among the living may also know the true facts behind the obscure memory of primordial contact with Alien Mind which ultimately prompted the ancient Chinese to strive to attain to the state of Hsien. They may know these facts because of extraordinary, exquisite Alien artifacts stored within the tomb-chamber of Shi Huangdi. Or they may know them because the materially immortal dead can materialize among the living members of the Secret Society of the White Pyramid at any time, and provide them with yet more secrets of the state of Hsien. One of these secrets may be that, in that realm that transcends time and space, it is once again possible to commune with Alien Mind, and to learn of all that has happened, and of all that will happen, and of the choices that mankind must now make. The White Pyramid of Xian may be the Materially Immortal Pyramid. It may be the archetypal burial place, so closely attuned to the state of Hsien itself that it exists virtually plunged in that place of material immortality, and so invisible to mortals. It may be the meeting place of the members of the Secret Society of the White Pyramid - both the living and the dead. It may be the ultimate Chinese Roswell - a benevolent Roswell, the necessary suppression of a truth so explosive that mankind as a whole is not yet ready to hear it. What crises of the human soul cause the White Pyramid of Xian to wink into physical existence for a brief moment of time? Was it the coming convulsions of Hiroshima and Nagasaki that enabled an American flyer to glimpse it long enough to photo-graph it in 1945? Was it the crash landing of two UFOs near Roswell, New Mexico, in 1947 - an alien intervention with no relation to Alien Mind, perhaps, and perhaps one which Alien Mind wished to prevent - that served as a catalyst enabling another American flyer to see and photograph the great White Pyramid a second time? Is the White Pyramid in its ultimate reality another Shambhala, a portal into other worlds which is now rapidly regaining physical reality in ours, so that it may resume its immortal task of carrying out the intervention needed when an entire civilization stumbles toward its end? Are there not those who can tell us? Why will they not speak out?